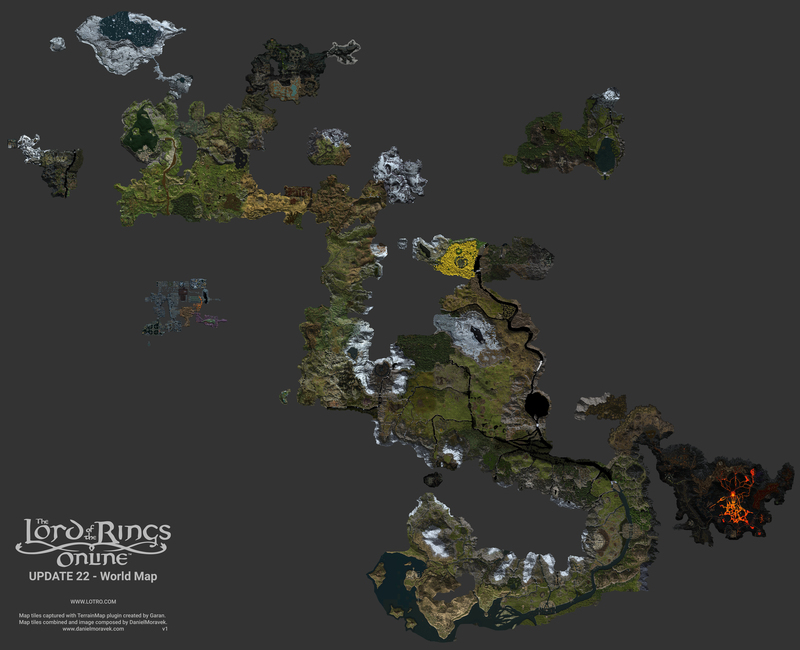 I have created LOTRO world map in 10K (10557x8579) resolution down-scaled from 50K source. Map tiles were captured for each region with TerrainMap plugin created by Garan and further edited into one large image. 2018/09/07 - Update 22 World Map released with updated content and new grey-mask. 2018/07/06 - Update 21 World Map released with Mordor Expansion. 2017/04/30 - Version 2 released - Added Zirakzigil to all WorldMaps and CompleteMaps (Rhovanion). Last edited by DanielMoravek; Sep 06 2018 at 10:04 PM. Very nice. One thing is bugging me - I can't think what the bit in top right corner is. This is something that I really missed when they took away the Lorebook. It was fun to see a bird's eye view of Middle-earth and its growth over time. It's exciting to see it become more and more complete, and I hope someday that we can explore it all! Thanks for doing this!! Love this! Im surprised at how good the quality of it is! I really enjoyed looking at that. Thanks for doing this. I appreciate in particular how you merged together the various zones. I see you choose the flooded Isengard version, probably because it's already intergated with Rohan. - I see how close the Deep Marshes are to the wastes... Is there a passage that I have somehow missed? Awesome work there OP, well done! PS. Any idea why the forum software wont let me post the above in capitals?? Amazing It really helps to get a feel of the whole map, because the ingame map can be confusing sometimes, with it's multiple layers. What also would be very interessting to me, is perhaps a kind of kingdom overlay. This could highlight current kingdoms and areas AND also old fallen kingdoms. I always like to run through the Shire, Breeland and Evendim and trying to grasp where the old kingdoms once were. Last edited by Arthur187; Apr 28 2017 at 07:10 AM. I'm surprised by how "big" is the Dale/Erebor area just from the instances. - Pretty much all North Rhovanion (Vales of the Anduin, Central and North Mirkwood, Kingdom of Dale, Erebor, Grey Mountains, Iron Hills), with the High Pass connection to Eriador (through a portal likely). This is the area with most content lore-wise and the one I want the most to go. - Anfalas wouldn't hurt, but I don't see how we will go there as the storyline has more interesting places to go I guess (North Rhovanion, Rhun, Harad, Lindon). We could use a dwarven White Mountains city however. Not yet that i know of, but the devs say in the future they may link it. Well, I think you mean Arthedain, Cardolan and Rhudaur, as the rest is somewhat well defined. I'm not 100% sure if there's any border in the North Downs between Arthedain and Rhudaur. If I am not mistaken, Wolves Den should be the rock area left of the mysterious spot (left of the dark area), and the area with the old woman home is the wood area just S of that. I also thought about the "Storm on Methedras" skirmish, but you can see that one in a small spot in the mountains west of Isengard. What's that island west of Forochel? Out of interest is posting map tiles of unreleased areas not slightly frowned upon? No direct link but from the OP you can see half of Mordor a la Google Maps. Back in the day this data mining would get you a serious slap for reverse engineering encoded .DAT files - which is where I know these images came from, or yes, using LUA plugins to pull them but whatever some portions are in game but not in public domain. I'm not wanting the OP to get in trouble, but potentially these maps are going to show the routes into Mordor, structures, and even if the expack will be split in two etc. Put it this way. I had the map of Rohan before release that I data mined and I did NOT release it out of respect to not ruin or spoil anything. YES, I data mined, did I make a website to share that data, nope. I find it a little surprising that the CM is saying this is "neat!" when I bet he hasn't checked all the links. Would you say the same if I started posting data mined item scans showing upcoming loot, festival rewards and so on? When someone does something for the community please check it. this for me IS a leak approved by the CM. To the OP I do think the maps are great, but I'd consider removing any portions that are not live yet. Even if it doesn't breach T and Cs I'd still be careful and considerate. Sorry if I am out of line or being an ### hat. Obviously the Mordor expansion is going to contain, well, Mordor landscape. You are entitled to your opinion and act accordingly, but I think it's fine, it will only generate more hype. I would love to see a list of the upcoming festival rewards (in fact, you can see the pets at least in the collections panel).